Exciting news! We will be opening for Dinner between 6-8pm starting on Boxing Day – December 26th 2015. We will begin with Saturday & Sunday evenings, then extend it to Thursdays through Sundays after New Years. The menu will have a strong Mexican theme of course – Burritos, Quesadillas, Nachos, plus a delicious chicken salad and Jesse’s famous Beef’n’Bacon BBQ Cheeseburger, with tasty options for the kids. We are licensed for the evenings now too, and will have special Margaritas as well as beer and wine for our guests’ enjoyment. 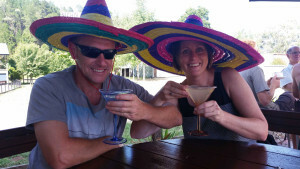 There will be colourful Sombreros available for our customers to wear to get into the spirit of things! First in best dressed for those And gorgeous fairy lights throughout the garden. Please spread the word, and we look forward to welcoming everyone during what promises to be an exciting and very busy holiday period!